Among the most powerful motives driving the English in their earliest attempts to explore the New World was the desire to find a northwest passage to Asia, what Raold Amundsen, who finally navigated it in 1906, called "the most formidable obstacle ever encountered by the inquisitive human spirit." Repeated English attempts from 1497 to 1613 ended in failure. Or did they? Although the explorers found no passage, they did begin to map the coast of North America, and, perhaps more important, they learned how to navigate northern waters. With this latter achievement, they began the process of transforming the Atlantic from a barrier separating England from the New World to a bridge linking the Mother Country to her colonies. Here we offer three selections that explore the meaning of what historian Glyn Williams termed "voyages of delusion." AUTOPSY REPORT. Ore samples were not the only things Frobisher brought back to England. In 1576 he returned with an Inuit (Eskimo), whose somewhat Asiatic features helped to persuade the English that Frobisher was on the right track to the Orient. A year later he aroused great interest with three Inuita man, a woman, and an infant. (Settle refers to them in his report.) Frobisher thought the man and women were husband and wife, but they were not. All three died shortly after their arrival in England, with Calichoughe, the man, dying first. A physician named Edward Dodding performed an autopsy and concluded that he died when two broken ribs punctured a lung causing an "incurable ulcer." In the post mortem Calichoughe becomes something of a metaphor for the English experience thus far in the New World. Dodding likens the economic resources England sought through the Northwest Passage to "nerves and life-blood," the very things that England lost, quite literally, with the death of Calichoughe. Lamenting the man's death, Dodding vents frustration over England's failure to realize any gain from the "Herculean labour" of Frobisher and other explorers, and he expresses his disgust over the superstitions of the New World inhabitants. Compare the description of John Cabot's 1497 voyage (Topic 1: CONTACT) to Lok's arguments and to Settle's account of Frobisher's 1577 exploration. How does Settle interpret the landscape he encounters? How does he turn the obstacles of the northern seas into assets for England? What is Settle's attitude toward the native inhabitants? Compare it with Dodding's attitude toward Calichoughe and the Inuit woman. What does Dodding mean when he says that Calichoughe evinced "Anglophobia"? Why does Dodding take such pains to explain English burial practices to the woman? Why was the search for a northwest passage a higher priority for England at this time than competing with Spain and France in North America? Why was the search not a high priority for France and Spain? 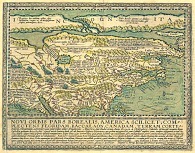 Image: Matthias Quad, map of North America entitled Novi Orbis Pars Borealis, America Scilicet, Complectens Floridam, Baccalaon, Canadam . . . , 1600. Reproduced by permission of Princeton University Library.